The importance of a cordless drill can never be overemphasized, as it can be easily used to perform home tasks. It enables you to handle different works, notwithstanding the distance. A lot of cordless drills have rechargeable batteries that allows you to be using one while charging another. Also, a majority of the cordless drills make use of lithium-ion cells, which that are lighter than older nickel-cadmium batteries. Professionals advice that one of the crucial things to do while shopping for the best cordless drills is holding it in your hand. Check if it is balanced, tough, comfy, lightweight to be able to handle in clumsy positions while undertaking a different screw. The next thing to check is the amount of power the drill possesses. A normal feature of the best cordless drills is the presence of half-inch chuck (the part of the drill that holds bits). The half-inch chuck is an indication that the drill is very powerful. Bigger drill bits can fit into bigger chucks. The cheaper and smaller drills usually come with a 3/8-inch chuck. You can settle for these models, as they are very appropriate for doing small jobs in the house. Here are the six best cordless drills that should be on your list whenever you want to shop for cordless drills. The Hitachi DS18DSAL has been confirmed by both professionals and the owners as the best cordless drill to have, approving its different features, versatility and strength. This drill comes with either a brushed motor or a slightly costlier and more effective brushless motor. Its maximum speed is 1,500 RPM with a weight of just 3.3 pounds and a length of 8 inches. These specs make it easy to move around. 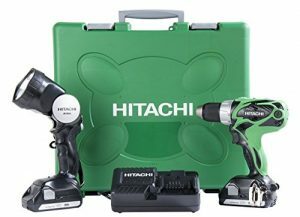 This Hitachi is popular among professionals for its speed, strength and fast charging capacities. Its features include a variable-speed trigger, a 22-stage clutch, a metal belt loop, an LED job light, and a ½-inch ratcheting metal chuck. It is also accompanied by a hard carrying case, carrying strap, dual-tipped driver bit, two batteries, and a stand alone five-position rechargeable LED flashlight that uses same battery as the drill. Reviews show that this drill is loved for its precision, amazing power (460 inch-pounds of torque), and mostly the cost. It comes with an attractive lifetime tool warranty and a two-year battery warranty. 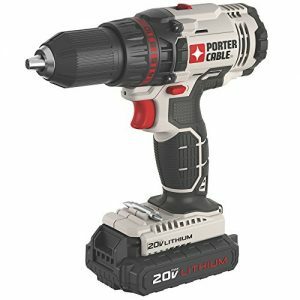 The Porter-Cable PCC601LB is your go-to drill whenever you need a cordless drill with almost the same power as the Hitachi, but can’t afford to give up over $100 for it. This drill is a 20-volt tool whose speed is equal to that of Hitachi – 1,500 RPM. It is slightly bigger and longer at about 3.5 pounds and just over 8 inches long. It comes with a 23-stage clutch, a ½-inch chuck, and an integrated LED job light to illuminate tiny screws. It also has two rechargeable batteries and a soft-sided carrying bag that will be more preferred to a hard case for people who have little storage space. Reviews reveal that this drill is tough, well-balanced and has suitable torque for the normal tasks. It has a three-year warranty. 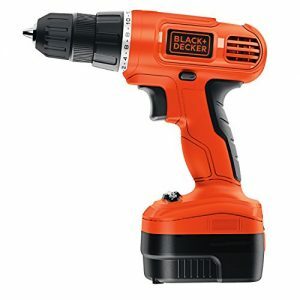 The 12-volt Black + Decker GCO1200C is what you need if you’re not looking for a very powerful cordless drill; if all you need a drill for is to quickly assemble furniture and other simple tasks. Not only is this drill dependable, it is also affordable with a maximum speed of 750 RPM. Its features include a 24-stage clutch, a soft-grip handle, varying speed and reverse, an easily detachable side-pack battery, a double-ended bit and a 3/8-inch chuck. It has a power of 150 inch-pounds of torque. 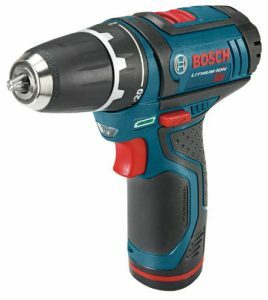 With its low power, it is very suitable for people who need a drill from time to time. It can be carried around the house easily and has a two-year warranty. The Bosch PS31-2A is a cordless drill that has so much power in a little pack. Similar to the Black + Decker, it is a 12-volt model, but has a higher speed and power of 1,300 RPM and 265 inch-pounds of torque. It is relatively light, weighing a little over 2 pounds with a 7-inch head, which makes it easy to carry about. Its features include a 21-stage clutch, varying speed trigger, 3/8-inch chuck, soft-grip handle, integrated LED work light, and a side-mounted battery gauge that lets the users know the amount of work they can do before a recharge. It is accompanied by two batteries and a soft-sided carrying case. Reviews reveal that it has a great battery capacity which exceeds even the bigger 18-volt drills. It comes with a warranty of three years for the drill and two years for the batteries. 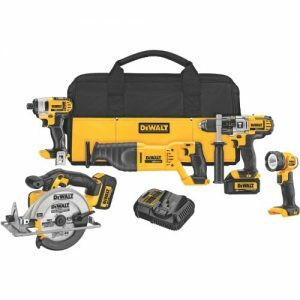 The DeWalt DCK590L2 Five-Tool Combo Kit is just the right drill for you if you’re looking for one that’ll avail you the use of some more tools which include a powerful cordless hammer drill, reciprocating saw, impact driver, circular saw, and LED work light. The tools are all 20-volt models that make use of rechargeable lithium-ion batteries. Included in the pack are two batteries and a carrying case too. This cordless drill has a maximum speed of 2,000 RPM, a ½-inch chuck and an all-metal transmission. Its impact driver has a maximum speed of 2,800 RPM, with a ¼-inch hex chuck. In addition, it lacks the amount of kickback the drill has. Reviews reveal that all the tools are durable, and can be used in performing all household jobs. The tools of the kit have a three-year warranty. 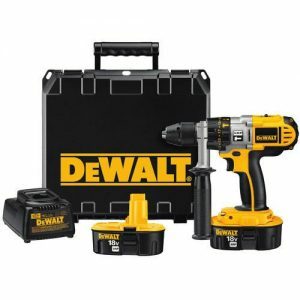 The DeWalt DCD950KX cordless drill/driver and hammer drill is your best bet when you can part with some more cash for an expert-level cordless drill that can take care of heavy-duty jobs such as drilling thicker wood, steel, brick and even concrete. It is an 18-volt model with a maximum speed of 2,000 RPM and 500 inch-pounds of torque. Although it is slightly heavier than other drills at over 6 pounds, it is appropriate for its amount of power. Its features include a 22-stage clutch, all-metal transmission, ½-inch self-tightening chuck, a 360-degree side handle, a hard carrying case and an integrated LED work light. It comes with two batteries, which are made to last longer than the usual rechargeables. It has a three-year warranty.